Ribbons, Christmas balls, strings, bells, stars or any other Xmas decorations. NOTE: Establish the size of frame you want and ask a volunteer to cut sticks to size. It is not recommended to hand secateurs to clients for safety reasons. Clients may have safety scissors to cut thin sticks. Take clients to gather sticks at your local park. Gather lots of them. Rinse them in soapy water and allow to dry in the sun. Seat participants around a table and place pre-cut sticks nearby. Encourage them to use their creativity; they may enjoy making something else other than a Xmas frame. 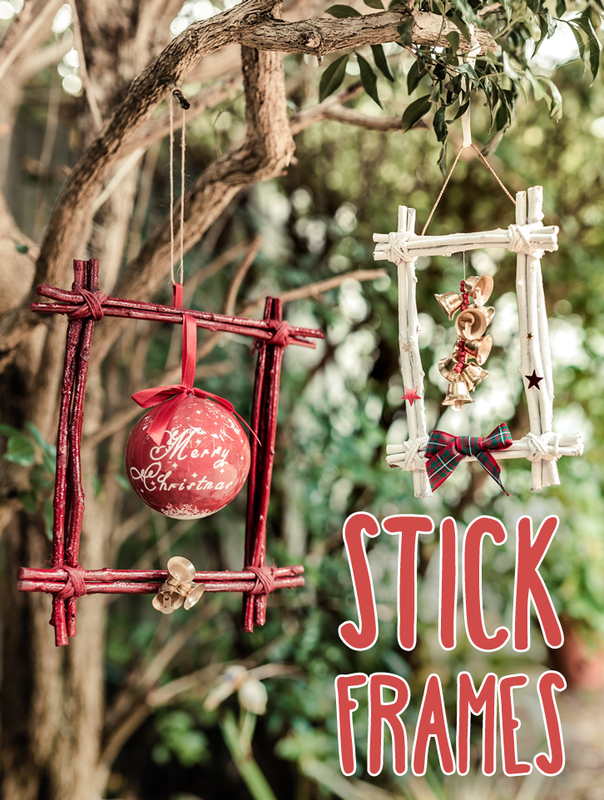 Tying the sticks can be tricky; secure the sticks with sticktape through the middle and tie each end with string before attempting to tie the frame together. Alternatively, it can be a two person job which will bring lots of fun and laughter! After tying frame together paint on one side (color of choice), allow to dry and then paint the other side. Allow to dry once more and then decorate as you like. Tie a string to the top to hang it with. Thank you for all your great ideas, makes my job so much easier. Love this idea, it is so Australian too. Thanks ladies..